My friend Devon. We lost each other when she moved away, then found each other again one night at a local coffeehouse when she moved back. She taught me how to steam artichokes during our many dinners together, then she suddenly moved away again. We’ve been parted long enough. Where will we meet again? Devon’s theory about artichokes is that they cook faster and taste better if they’re hydrated first. I think she’s right. The sauce is a low-oil version of a spring salad dressing created by Karri Ann Allrich in “Cooking by the Seasons,” a collection of vegetarian recipes featuring seasonal ingredients. It’s powerfully flavorful and leftovers can be tossed onto a one-person salad. Trim off spiky ends of artichoke with knife and/or scissors. To hydrate artichokes, cut off stem near base of artichoke and cut an X into the stem end, an inch or more up into the artichoke heart. Set the artichokes, cut end down, into about a pot containing about 2 inches of water. Let soak for 20 minutes to 1 hour. Remove the artichokes, add a steamer basket to the pot, and place artichokes in the steamer basket. Add extra water if needed. Steam 25 – 45 minutes, depending on the size (if very small, 20 minutes). Check every 5 minutes or so by pulling off a leaf and testing it with your teeth. Be sure to check the water level periodically during steaming. Serve hot or chilled. If you chill them, store them upside-down so they don't get soggy. Mix all ingredients together in a dipping bowl. Mint flavor becomes stronger as time goes by. 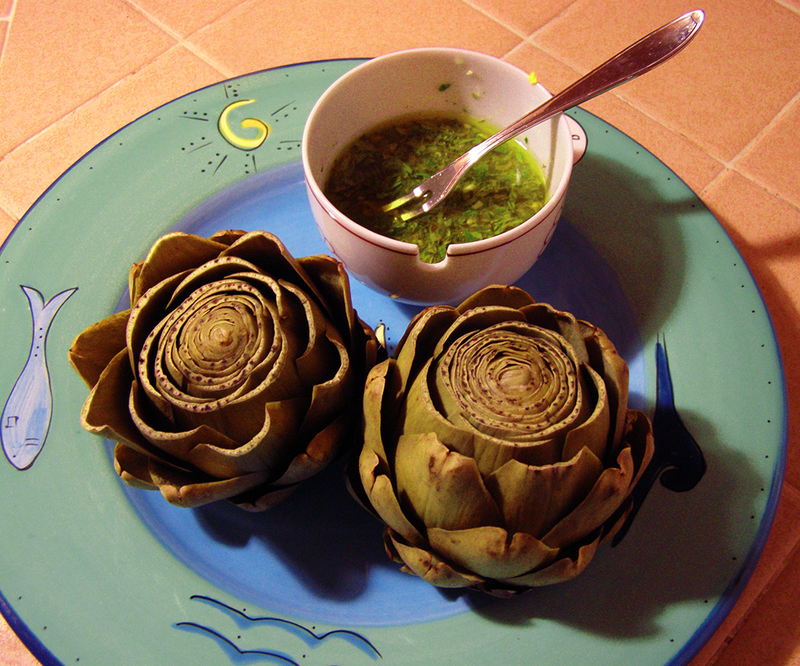 Serve with hot or cold artichokes. NOTE: Adjust the amounts of water and oil to your taste. I prefer using the smaller amount of olive oil and a medium amount of water, which gives a strong lemon flavor. If the flavor is too strong for you with maximum oil and/or water, I’d try adding a little mayonnaise.